When Dean, at this point well off the reservation, growls these words at Cyrus Styne (Connor Pryce) right before shooting him point blank in the head, we have been well set up to see the youngest member of the (Franken)Styne family as a narrative substitute for Sam Winchester. It all fits; nerdy smart college student, brother, odd man out in his family and rejecting the family business. And between that brutal act and the awful words that Dean throws at Sam in the opening scene during Charlie’s hunter’s burial, we now know that this is no longer the Dean we all know and love; the Dean who is a hero, to the world and most of all, his little brother. Pushed over the edge by the brutal murder of Charlie, we are finally led to believe that this cold, menacing, deadly efficient hunter, could actually hurt the innocent, his friends and even his beloved brother, just like Cain predicted. However, I think when Dean says those words to Cyrus right before he pulls the trigger, he is as much talking about himself. Sam said it; Dean thinks that the Mark is his fate. Dean has always had darkness in him, he has always had the capacity to be brutal, to cross lines and it has always been Sam who would call him back, who would keep him human. The Mark fuels and in turn feeds on that darkness; Dean’s guilt alone could probably keep it going for decades to come. When he tells the young Styne that the bad will always win, it may as well be an internal monologue about the hope he has lost. 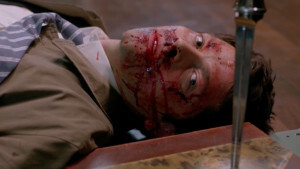 Shooting the pleading crying Cyrus in cold blood not only kills the boy, it also kills another part of Dean Winchester. We see the Stynes in action as they initiate poor Cyrus into their monster building ways, by having him carve up a bully to give his brother Eldon (David Hoflin) a new arm. Eldon redeems himself for coming home empty and one handed, by promising a big payday from this neat bunker and not so secret hide out the Winchester allowed him to escape from. He takes young Cyrus with him and leaves just in time to escape the wrath of Dean Winchester, dangerous and deadly on a normal day, but unstoppable hulked out on the Mark of Cain. From Dean using his legs to overpower a sheriff’s deputy to watching him cut a swath through guards to make his way to the Styne mansion, Dean unbridled and tapped into pure cold rage is a chilling sight. It makes you realize just how good a killer Dean is, when his humanity doesn’t hold him back. I’m not sure what is scarier, this Dean, or the demon we met earlier in the season. Not even Daddy Styne (Markus Flanagan) and his operating table can stop this rampage and soon all the Stynes are dead. Well, except for all the women who birthed this dynasty, and the Stynes spread all across the globe that Eldon boasted about, but perhaps this isn’t the last we have seen of them. Dean catches up to the last few remaining Stynes at the MOL bunker, just as Eldon gets ready to light a match to burn all those beautiful books and also Dean’s flannel, his records and, in another gasp inducing moment in the episode, the picture of Mary he keeps in his room. Of course, as bad guys do, Eldon, in all his hubris, talks too much and before he can even roll up the sleeve on his newly sewn on arm, Dean shoots him right between the eyes. This is where Cyrus pleads with Dean to let him live, as he is not really responsible for his family’s misdeeds, but Dean shows no mercy. Meanwhile, Rowena refuses to do any more work, until Sam holds up his end of their bargain by killing her son. 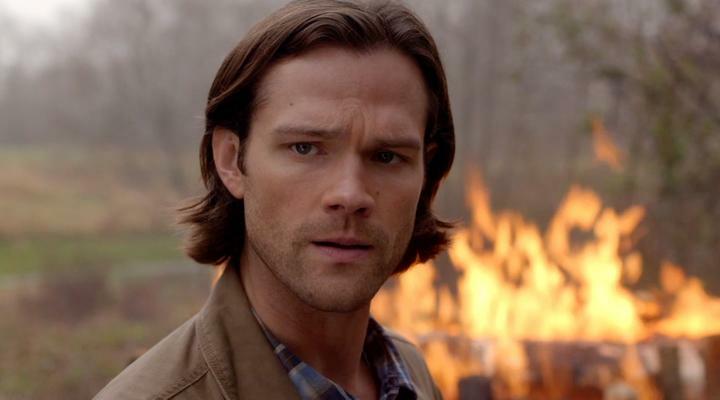 Sam sets a trap for Crowley but the demon king proves too strong for his mother’s magic. In fact, in all his determination to point out all the evil Crowley has done, Sam inadvertently invigorates the demon within and as Crowley’s eyes glow red, he simply walks away after showing Sam just enough mercy to prove that he now only lives because the king of hell allowed him to. Cas finally, and again too late, catches up to Dean, who could not care less about Cas’ pleas to stop. In a very effective scene, Cas tells Dean that even if he keeps insisting to go it alone and manages to hold out for centuries as Cain did, Cas would still remain as a witness to see the demon Dean will eventually become and he would be the one left to watch him murder the world. 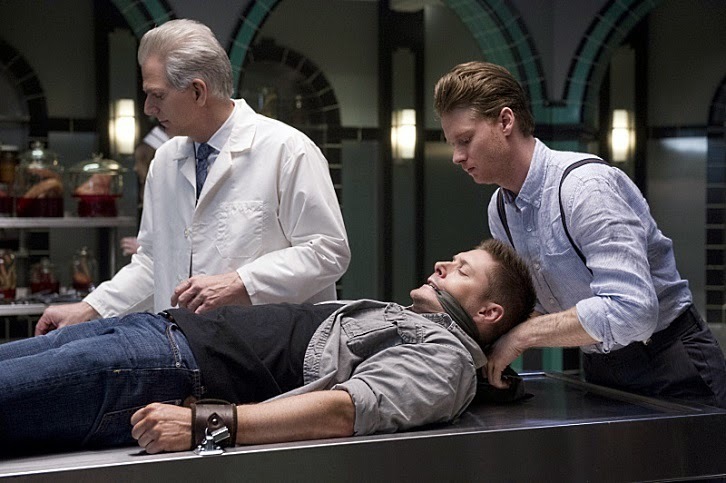 Cas is powerless to stop Dean from leaving the bunker however and Dean beats him without mercy. I am puzzled at how ineffective Cas is, even with his own remaining grace restored. I’m not sure why he is this weak, when he was able to restrain a fully demon Dean with borrowed grace, but I guess I can go with the theory that only a trace of his own grace remains and he is still damaged, or perhaps Cas was holding back so as not to hurt Dean. He could have rendered him harmlessly unconscious with a touch however, so it stays unclear. As it is, Dean beats him bloody. It is a chilling and incredibly brutal scene, and in parallel with the end of the scene between Crowley and Sam, Dean lets Cas live. 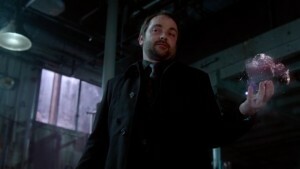 He wants him to deliver a message; he and Sam better back off, or next time he won’t miss with the angel blade. We are now set up for the story to come to a head and to pay off he season’s arc. Finally we see Dean as dark as we have been told he was becoming. I had some issues with this episode, even though there was much to love. The building of the tension around the Mark of Cain has had some serious pacing issues, not helped by the odd placement of some episodes that took momentum away and should have aired earlier in the season. After such a slow build, I found it jarring to have a Dean, who is still capable of feeling enough to be distraught over Charlie’s death be suddenly so far gone to say he wished his brother dead instead. I understand that it all was to illustrate that the Mark of Cain has finally taken hold and that he now poses a real danger to those he loves, but it should have felt more organic and not like a writing exercise. It also bothered me that the Stynes so easily were able to find and break into the bunker. It is supposedly warded by powerful magic and requires a special key to enter. The Winchesters have been far too careless with their hideout anyway, and I hope that they will either take some measures to secure it again, or perhaps abandon it all together and head back out on the road. I have not minded the addition of the Men of Letters legacy and the bunker home base as some have, but I have to admit I was ready to see what would happen next if it were allowed to burn. I am also still puzzled by the lack of established rules about heaven and angels and how they affect Cas. It certainly seems like they are being made up as they are convenient for the story, and that does not serve the character or that story well. On the other hand, performances were great and Jensen Ackles once again surpassed high expectations in his portrayal of this intensely scary and tragic version of Dean Winchester. Jared Padalecki as always was able to give Sam all the humanity and compassion his brother lacked, and his insistence to see him as scared and lost, even after the violent words Dean threw at him, was heartbreaking to watch. I am thrilled to see Crowley and Mark Sheppard restored to the terrifying, evil being he is, complete with accent, snark and suits and Ruth Connell as Rowena continues to be a delightful and untrustworthy presence. Misha Collins also was able to give Cas honest vulnerability in an important scene. This promises to be one doozy of a finale, going by where The Prisoner (as written by Andrew Dabb and directed by Thomas J. Wright) left off and what the previews have promised. We are now primed to believe that anything can happen and after all this build up, we are due a big pay off. Where do you think it will all end? Give us your thoughts in a comment below, as always.